The Ballad of Gay Tony out now! 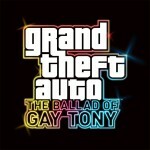 Grand Theft Auto: The Ballad of Gay Tony is now available, it can be obtained in two ways. Firstly via the Xbox LIVE Marketplace for 1600 Points (.99 / �12.15). The second way is to purchase Grand Theft Auto: Episodes from Liberty City, which also includes The Lost and Damned, for .99 (�34.99). Hope you're all enjoying the game by now! Remember our forums are always here if you need assistance with anything, or if you just want to share something cool you've found. Registration is free, so if you aren't already a member, what are you waiting for? It's a small, not particularly detailed picture, so we can't really tell much from it. Yet. What do you think? Credit to DigiShine on GTAForums for the scan. The Ballad of Gay Tony reviews are in! <embed src='http://media.rockstargames.com/products/rockstar/media player/RockstarMediaPlayer.swf?skin=episodesfromlibertycity/EN/embed&vidID=191&cacheAG=true&nogametitle=true' quality="high" bgcolor="#000000" menu="false" width="480" height="300" name="RockstarMediaPlayer" align="middle" allowScriptAccess="always" type="application/x-shockwave-flash" pluginspage="
This weekend some special events are taking place to celebrate the launch of Episodes from Liberty City. To celebrate tomorrow's launch of Grand Theft Auto: Episodes From Liberty City (in stores on disc for Xbox 360 this Thursday), featuring the all-new episode The Ballad of Gay Tony, this weekend on Xbox LIVE will be chock full of special events to log on, join and play the most intense Grand Theft Auto multiplayer modes ever. And to ensure every fan can participate in these exclusive events, Xbox LIVE multiplayer will be absolutely FREE ALL WEEKEND for non-Gold LIVE members playing Grand Theft Auto IV, The Lost and Damned, and The Ballad of Gay Tony. From Friday, October 30th through Sunday, November 1st, you can sign on to Xbox LIVE and face off in Liberty City with multiplayer action against players from Rockstar North and against Henry Santos Jeter from the legendary latin megaband Aventura (and host of The Ballad of Gay Tony's Santiago Mix on San Juan Sounds) as part of this special Episodes from Liberty City Xbox LIVE Weekend. You can see the full schedule over at the R* Newswire. IGN are still pumping out those Ballad of Gay Tony gameplay videos. Check out these two new ones, "A City Under Seige" and "Nitro Makes Everything Better." Rockstar have released a couple of new screenshots from The Ballad of Gay Tony. Check them out below. IGN is continuing its releasing of The Ballad of Gay Tony gameplay videos up until the game's release. This one features base jumping. Here's a quick preview of some of the new in-game TV content appearing in The Ballad of Gay Tony. <embed src='http://media.rockstargames.com/products/rockstar/media player/RockstarMediaPlayer.swf?skin=episodesfromlibertycity/EN/embed&vidID=189&cacheAG=true&nogametitle=true' quality="high" bgcolor="#000000" menu="false" width="480" height="300" name="RockstarMediaPlayer" align="middle" allowScriptAccess="always" type="application/x-shockwave-flash" pluginspage="
As many of you are no doubt aware, the PSP version of Chinatown Wars is now available worldwide, having been released in stores across North America on Tuesday, and then yesterday in the rest of the world. Just like it's DS counterpart, the PSP version has also been very highly rated by critics. It is currently Gamespot's highest rated PSP game of all time. It's 9.5/10 rating surpasses that of both Liberty City Stories (8.6) and Vice City Stories (8.4) - so if you were a fan of those, you're sure to love Chinatown Wars. Gamespot didn't really have that much to say of any flaws, apart from the fact some of the DS minigames don't play as well on the PSP (which we expected), and some camera issues. Yesterday IGN posted a couple of new videos from The Ballad of Gay Tony. The first video shows the cutscene from the mission "Caught with Your Pants Down", while the second video shows gameplay from the mission. Obviously if you don't want this particular mission spoiled, don't watch the videos! You can read details of the mission over at IGN. IGN have posted a couple of Ballad of Gay Tony videos tonight, both featuring actual gameplay from the game. The first video is an explosion montage, featuring explosions, obviously. Rockstar has released a new video showing off base jumping in multiplayer free mode. Check it out below. "Use parachutes to take part in Multiplayer BASE Jumping throughout Liberty City. Find the 9 BASE jump marker locations scattered throughout the city in Free Mode and hit Right Button to warp you (and anyone else with you in Multiplayer) to the top of the building. Clean, successful and well-executed BASE skydiving jumps will be tracked by time and other statistics that you'll be able track and compare with Friends at Rockstar Games Social Club." <embed src='http://media.rockstargames.com/products/rockstar/media player/RockstarMediaPlayer.swf?skin=episodesfromlibertycity/EN/embed&vidID=188&cacheAG=true&nogametitle=true' quality="high" bgcolor="#000000" menu="false" width="480" height="300" name="RockstarMediaPlayer" align="middle" allowScriptAccess="always" type="application/x-shockwave-flash" pluginspage="
<embed wmode="transparent" src='http://media.rockstargames.com/products/rockstar/media player/RockstarMediaPlayer.swf' flashvars="skin=theballadofgaytony/EN/audio&vidID=187" quality="high" bgcolor="#000000" menu="false" width="310" height="90" name="RockstarMediaPlayer" align="middle" allowScriptAccess="always" type="application/x-shockwave-flash" pluginspage="
Part four of Rockstar's Chinatown Wars PSP audio preview is now available, listen to Turntables on the Hudson below. <embed src='http://media.rockstargames.com/products/rockstar/media player/RockstarMediaPlayer.swf?skin=chinatownwars/EN/audio&vidID=6664211' quality="high" wmode="transparent" bgcolor="#000000" menu="false" width="310" height="90" name="RockstarMediaPlayer" align="middle" allowScriptAccess="always" type="application/x-shockwave-flash" pluginspage="
Chinatown Wars for the PSP is released tomorrow in North America, and will be available from October 23rd in Europe. The latest episode of GameTrailers TV aired today and featured exclusive new footage of The Ballad of Gay Tony. You can watch it online below or at GameTrailers.com in HD. The episode also contains an interview with Rockstar's Jeronimo Barrera. Rockstar also made a small update to the official site last night, adding 2 new screenshots plus more details on the nightlife. Rockstar have released a new video for Episodes from Liberty City. "Go behind the scenes with FIZZ TV as celebrities party it up in the latest video from Grand Theft Auto: Episodes from Liberty City, featuring The Ballad of Gay Tony." <embed src='http://media.rockstargames.com/products/rockstar/media player/RockstarMediaPlayer.swf?skin=episodesfromlibertycity/EN/embed&vidID=182&cacheAG=true&nogametitle=true' quality="high" bgcolor="#000000" menu="false" width="480" height="300" name="RockstarMediaPlayer" align="middle" allowScriptAccess="always" type="application/x-shockwave-flash" pluginspage="
Rockstar have updated the official site with details of updated multiplayer modes (which you can read about below) as well as 10 brand new screenshots. Make an extra for every assisted kill. You can also earn money for ending other players' kill streaks. New locations, vehicles and weapons (including the parachute) are also available. Race and GTA Race information and screenshots will be coming soon, as will a video showing it all off. Rockstar have released 10 new screenshots of The Ballad of Gay Tony. See more in our screenshot gallery. Rockstar have posted another audio preview for the PSP version of Chinatown Wars. Often referred to as 'post-rock', this Chicago-based outfit was one of the very first bands to fearlessly incorporate hip-hop, techno, dub and drum'n'bass into modern guitar-based rock'n'roll in the late 1980's, earning them worldwide acclaim. Influential to this day, Tortoise's most recent album is the critically acclaimed Beacons of Ancestorship. Check out the audio player below for a snippet from their station in Grand Theft Auto: Chinatown Wars for PSP. <embed src='http://media.rockstargames.com/products/rockstar/media player/RockstarMediaPlayer.swf?skin=chinatownwars/EN/audio&vidID=6664092' quality="high" wmode="transparent" bgcolor="#000000" menu="false" width="310" height="90" name="RockstarMediaPlayer" align="middle" allowScriptAccess="always" type="application/x-shockwave-flash" pluginspage="
Rockstar have released the first trailer for the PSP version of Chinatown Wars, check it out below. The game it set for release on October 20th. <embed src='http://media.rockstargames.com/products/rockstar/media player/RockstarMediaPlayer.swf?skin=chinatownwars/EN/embed&vidID=179&cacheAG=true' quality="high" bgcolor="#000000" menu="false" width="480" height="300" name="RockstarMediaPlayer" align="middle" allowScriptAccess="always" type="application/x-shockwave-flash" pluginspage="
You may also be interested to know that IGN have posted an in-depth Chinatown Wars Q&A. Episodes from Liberty City trailer 2: "There's Always a Girl"
The second trailer for Episodes from Liberty City featuring both The Lost and Damned and The Ballad of Gay Tony is now live. The trailer is entitled "There's Always a Girl", the song featured is "The Look" by Roxette. <embed src='http://media.rockstargames.com/products/rockstar/media player/RockstarMediaPlayer.swf?skin=episodesfromlibertycity/EN/embed&vidID=178&cacheAG=true' quality="high" bgcolor="#000000" menu="false" width="480" height="300" name="RockstarMediaPlayer" align="middle" allowScriptAccess="always" type="application/x-shockwave-flash" pluginspage="
Grand Theft Auto IV received an Xbox 360 title update today which adds 10 new achievements to the game. The achievements are worth a total of 250 points and bring the game's total to 1500. All the new additions are of course for The Ballad of Gay Tony. Thanks to Xbox360Achievements.org for this. Rockstar have added 6 new screenshots to the official Ballad of Gay Tony website. Check them out below. Rockstar has added a page about some of the new vehicles you'll be finding in The Ballad of Gay Tony. They've also added 5 new screenshots of said vehicles. IGN has posted a new trailer for the upcoming Episodes From Liberty City pack, which features footage from both The Lost and Damned and The Ballad of Gay Tony - the latter introducing us to Armando Torres and Henrique Bardas. "Armando and Henrique are two of Luis Lopez's oldest friends. They grew up together, went to school together, and got in a lot of trouble together. Henrique isn't too bright, but he's big, tough, dependable and knows how to use a gun. Armando's a little guy who talks a big game, and considers himself the brains of the operation - not difficult given his partner in crime. Armando, in particular, resents Luis for getting out of the neighborhood and above his station, but Henrique and Armando remain fiercely loyal to Luis and always have his back. Luis can call on his friends whenever he needs weapons and vehicles, or back-up on certain missions. Armand and Henrique are always around to engage in other activities, whether it's visiting the clubs, hitting some bars or heading to the driving range for some golf."